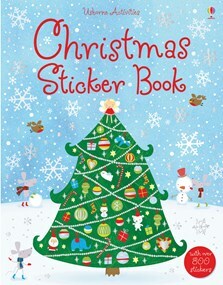 An enchanting sticker book filled with Christmassy scenes including Santa’s busy workshop, winter fun on a frozen lake, building funny snowmen, decorating a Christmas tree and filling Santa’s sack with presents. There are over 800 stickers to use to complete the scenes, including shiny foil stickers. Also contains a sticker advent calendar to complete. This fantastic sticker book will certainly keep children busy in the run-up to Christmas. There are over 800 stickers which can be used to decorate 12 Christmas scenes, from building a snowman and making treats, to decorating Santa’s workshop and tinsel town. Children can also use the stickers to create their own cards or crafts, as there are plenty to choose from. At the front of the book there is also a sticker Advent calendar to complete.